"Welcome to the squad." Well Go USA has released the first teaser trailer for a new action thriller from the Philippines titled BuyBust, the latest film made by veteran Filipino filmmaker Erik Matti. This looks action packed and intense as all hell, with some badass fight scenes for sure. The plot of BuyBust involves the anti-drug enforcement agency staging a massive drug bust in the slums of Manila in the Philippines. But when things go wrong, they get stuck in the middle of a brutal drug gang and hordes of bloodthirsty citizens, so their only option is to fight their way out. Anne Curtis (from In Your Eyes, The Gifted) stars, along with Chutimon Chuengcharoensukying, Victor Neri, Joross Gamboa, Nafa Hilario-Cruz, Brandon Vera, and Nonie Buencamino. This looks way better than you're probably expecting - it's worth a watch. After surviving the slaughter of her entire squad in a drug raid compromised by dirty cops, anti-narcotics special operative Nina Manigan (Anne Curtis), is eager to go head-to-head with the drug cartels that hold a bloody grip on Manila. But when her new mission in the city's most dangerous slum goes south, the angry civilians turn on her squad. Trapped between a brutal drug gang and hordes of bloodthirsty citizens, their only option is to fight their way out, turning one claustrophobic street at a time into a symphony of apocalyptic violence. 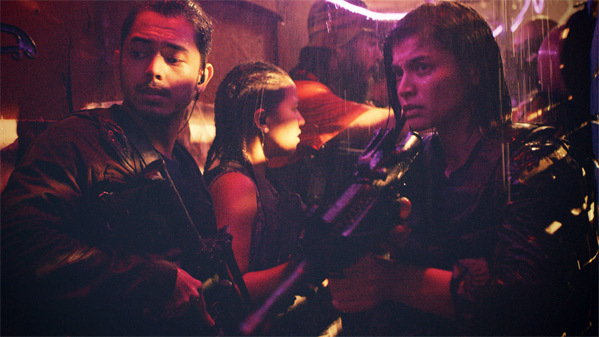 BuyBust is both written and directed by Filipino filmmaker Erik Matti, of many films previously including Gagamboy, The Arrival, Tiktik: The Aswang Chronicles, On the Job, Rigodon, and Honor Thy Father. This just premiered at the New York Asian Film Festival last month. Well Go USA will release BuyBust in the US, but no release date is set yet. Stay tuned for more. First impression?